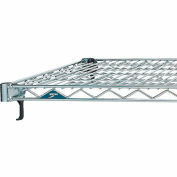 Metro Extra Shelf For Super Adjustable 2 Shelving - 24"D - 60"
Metro Extra Shelf For Super Adjustable 2 Shelving - 18"D - 48"
Revolutionary design places METRO Super Adjustable 2 Shelving among the most flexible on the market today. 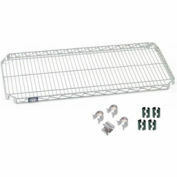 Entire storage unit sets up easily without tools. Begin with starter units and add on in any configuration using S-hooks. 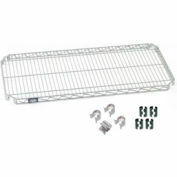 Shelves can be added or adjusted in precise 1" increments. 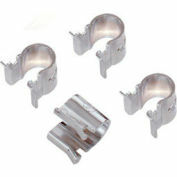 Simply pull corner-release levers, reposition wedges along 1" dia. 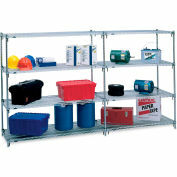 grooved Site-Select posts, and slide shelf to new height. Shelf remains securely in place. Open-wire design improves sprinkler effectiveness, air flow, and eliminates dust build-up. Finished in durable chrome. Stainless and Metroseal finishes available for selected models. NSF certified. NOTE: Shelf capacities are based on evenly distributed loads. 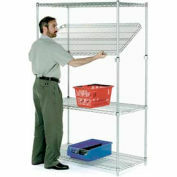 Metro Extra Shelf For Super Adjustable 2 Shelving - 24"D - 72"